recommended for: Fans of Cinder by Marissa Meyer, Ella Enchanted by Gail Carson Levine, Cruel Beauty by Rosamunde Hodge, and good old fairy tales. 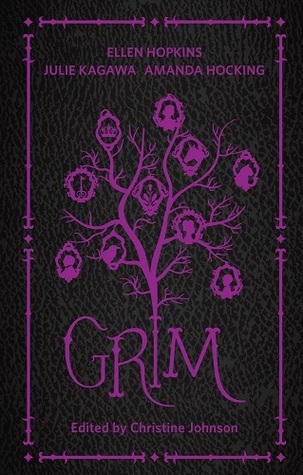 Inspired by classic fairy tales, but with a dark and sinister twist, Grim contains short stories from some of the best voices in young adult literature today. This collection drew me in partly because of its stellar cast of authors, but mostly because I've been obsessed with Grimm's fairy tales. They were my favorites as a child. I still have my old, warn-out compilation that my mother would read to me at night--that eventually, I would read for myself, over and over. As a tribute, Grim was about half successful. The "dark and sinister twist" is only applicable to some of the stories; I wouldn't even really sell it like that. You could tell that they chose authors and asked them to write, rather than choosing stories, because some of the authors seemed to get the point and others very much did not. On the whole, I enjoyed it. However, I would have liked to see a little more of the fairy tale spirit, especially in a couple of the science-fiction stories. Marissa Meyer clearly made it work; these just go too heavy on the sci without the hints of fairy and whimsy. This was a clever story. I enjoyed the characterization and the writing. It was interesting, a teenage girl with a psychic for a mother. Hawkins did a great job of showing Lana's ambivalence--her love for her mother, her embarrassment. The plot was an interesting mystery with a twist ending, but it was really lacking in fairy tale charm. It read a lot more like a typical paranormal story. This story was really cute. It's about a sort of magical creature, a luck-giver who helps the prospering of those it's given to, so long as they believe. The relationship between the creature, Fig, and Eli is sweet. You really come to know and love Fig in a short time. The twist is heartbreaking, but it all comes around in the end. It's a clever take on the wish-givers in Grim that takes a new angle: the importance of achievement and self-determination. This is my first introduction to Lo, and it won't be my last. Her story is the perfect mix of myth and fairy tale in the modern world, combining elements of Hades and the Celtic fay in a series of secret dance clubs accessible only to a few lucky girls. 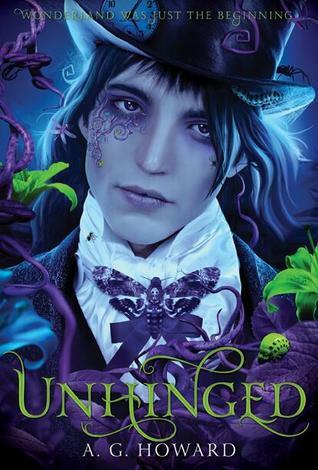 It's well-paced, Liv is an easy character to slip into, and the chilling mix of magical extravagance and deadening decadence is perfect. It was one of my favorites in the anthology. This is a perfect retelling of the original "Raven Princess" in Grimm's. It follows the story line closely and sticks to the traditional trappings of a fairy tale, but with additional characterization, modern additions, and a twist ending that turns the original tale on its head. There's always the danger of sticking too close to the original and doing no more than adding a few words, but Skovron makes this one his own. This is a fabulous revamp of one of my absolute favorite Grimm tales. It brings a darker, more sinister element to parts of the original tale that were left unsaid--an unflinching story of sexual abuse and ultimately, empowerment. It skips the second half of the original; even though I love that part, the ending here is more appropriate to the story Mitchell is getting across. Instead of love and Prince Charmings, it puts the focus on Merula and her quest for freedom. And it does so with careful honesty and snappy writing. This is a very different Hopkins from Crank. Here we have a classic tale of demons, magic mirrors, and beautiful cold queens locked away in cold towers. Then of course a pair of lovers, one stolen away, one brave girl gone on an adventure through snow and witches' spells to reclaim her love. It's a sweet story, very magical and whimsical, although I don't really get why it's divided into Acts. The ending is a little lackluster, though. It's almost too classic for my taste. You can throw a stone and hit a Beauty and the Beast retelling, but this one has a special place in my heart. Beast is a strange mash of animal, human, and plant; he's gentle, quiet, sullen. Beauty is a petulant girl seeking escape, and also raging for Beast to show some emotion and fight with her. It's the original with some edge, a slow-burning bonding that creates a lot of "Awws", and a sweet, open ending that leaves a smile. The writing is punchy and Beauty is an easy sell. Don't expect smiles from this one. But it's a great sell for Kagawa's imagination. We have some brothers, a witch, and a beautiful girl whom the stuttering youngest brother is smitten with. It's a deeper look into character than you get in most fairy tales, and the twist ending actually threw me for a loop. Kagawa also writes with a combination of wit and edge that I really enjoyed. This one didn't really do it for me. It was fine as what it was: a ghost story that turns your head around. I enjoyed it as that. But there was just nothing about it that screamed "fairy tale." It was a ghost story, nothing more, and pretty generically so. Again, not really fairy tale material. It's a cool science-fiction tale. It's a little Cinder-like, which an android heroine in love with a human boy. A disease unable to be cured. Humans desperate for an answer. It was cool. The ending shocked me. But there's nothing that really separates it from your typical sci-fi and gives it a link to "Grim." It didn't take me long to catch the Hansel and Gretel reference. This one is modernized, two siblings abandoned in the woods after a family camping trip. Derting cleverly inserts the old themes--the candy house, the witch--into new skins. It's not remarkable, just good writing. This one was cute. It's a modern-day witch granting dubious gifts and curses: one daughter blessed with jewels falling from her mouth, one cursed with serpents. It combines that fairy element with the modern-day problems of a manipulative, alcoholic mother, a skeavy neighbor boy, and two girls caught in the crossfire. It's bittersweet and brings some reality into fairyland. Besides that this was really straight science-fiction and way off the theme, it was just a blah kind of story. The whole central conflict was completely moot. It read like The Mad Scientist's Daughter by Cassandra Rose Clarke, only with a quarter of the depth. I didn't love this one, but after re-reading some actual fairy tales and finding its source material, I did really appreciate what McEntire did to modernize this story. Cannibal thieves are turned into a rock band. The damsel isn't so distressed. It didn't really find a place with me, but it's definitely solidly written. This was a bit on the silly side. Basically you have a modern-day frat boy transported back into a fairy kingdom by a vindictive witch, punishing him as a Beast for his spoiledness. Beauty is an overly honorable girl who signs on as carriage boy. Throw in some gender-swapping, accidental homosexuality, and cross-cultural slang and it's a pretty funny story. I was never on the Hocking bandwagon. I find her stories to have potential but lacking polish. But she won me over with this one. It's another of my favorite stories, retold here by breathing life into the original characters and giving depth to the plot. The writing is tight, the characters are admirable (though a little too fairy tale unflawed), and it cleverly manages to outwit the instalove problem. I absolutely loved the story. Imagine a young man with the power to cure death--with a kiss. A whole agency of them. It's like Sleeping Beauty for the highest paying customer. When kissing boy gets paid not to raise his latest customer (I crack myself up), it brings him to a terrible choice: take the money for a new start, or raise the girl who once tormented him? It's a beautiful story of redemption that I would love to see go further.